Our new topic this term will be ‘Events and People from the 1900's.’ We will learn about the Titanic and read ‘The Lighthouse Keepers Lunch’ during the first half of the term and we will be making our own boats and lighthouses out of boxes and plastic materials. We would be grateful if you were able to help us with donations of the following recycling materials to assist us in our modeling: any bottles, boxes, cartons, plastic containers, tubes, straws, lollipop sticks, paper, and card will be very much appreciated. If you are able to help, please send your contribution into school with your children as soon as possible. 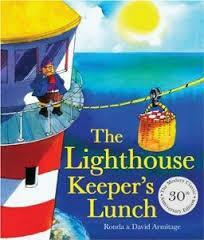 We will be making a model of the lighthouse keeper's lunch this week. On Thursday 27th February Year 2 had some visitors to their class. Year 2 are currently reading the story of 'Melisa's School Holiday' and the characters in the story visited the children so that they could ask them some questions. How exciting! We have been learning to control the ball with a partner. In art today we have been painting geometric patterns using primary colours. In religious Islamic Art, geometric designs are commonly used. The beautiful geometric patterns are a sign of unending repetition, which is believed by some to encourage the contemplation of the infinite nature of God.